Investiture envoy Wang Ji for 1683 noted on a place for drill in arms and for the practice of martial arts in Naha, used by the officers and men of the Tenshikan (the lodgings of the Investiture envoys and their followers, as well as guardsmen from Kume village only). He used the Chinese expression yanwu-chang 演武塲, which corresponds to enbu-ba in Japanese reading. Accordingly, the first time the term enbu was used in Ryūkyū history was in a Chinese source. At that time it referred to military exercises. In Japan, the term enbu 演武 appeared frequently since 1895, when the Dai Nippon Butokukai held its first Butokusai Dai Enbu Taikai, which was henceforth continued annually. At that time it also referred to military exercises, though it made use of traditional martial arts, which still were considered valuable military tactics and also used to instill a “Japanese martial soul” in large parts of the population. The Dai Nippon Butokukai also organized the Youth Martial Demonstrations Meeting (Dai-jū-kai Seinen Dai Enbu Taikai). In 1908, six students of the Shuri Middle School participated in the 10th edition of this demonstration and performed karate in front of Jigorō Kanō and other visitors. Enbu at shrines in Japan are a great opportunity to observe various classical styles. Going back in history again, Bu no Mai is also a historical expression found among the entertainment arts presented for the Chinese investiture envoys (sappōshi) of 1719 and 1756. Here the Bu no Mai referred to a dance by six “warriors” and it was actually a stick dance in which they alternately attacked and responded to the rhythm of music. Later the name Bu no Mai disappeared, but for 1837 we find a dance called Tōbō 唐棒, that is, the Chinese Gudgel. It was also demonstrated as an entertainment for the Chinese investiture envoys. Such dance demonstrations were managed by a “Bureau of Crownship Dances”, which employed its own dance teachers. BTW, Tōbō followed the same naming convention as Tōdī, but its written occurrence preceded the latter by 30 years. Just like Tōdi and Karate, Tōbō could be pronounced Karabō. In 1867, and again as an entertainment presented to Chinese investiture envoys, the “Festival of School Arts and Various Other Arts” (called Sanrōchu at the time) were presented by members of the Kume Village Meirindō school at the royal tea villa in Sakiyama (Ochaya-udun). The martial arts as part of this performance are today famous as the “Ten items of Bugei”, but this is not their historical name. And just like in all the earlier cases martial arts were just a small fraction of the complete programs. The Kanji “Mai no Te” 舞手 with the reading of “Unsu” added. I think it was pointed out here for the first time. Interestingly, Arakaki Seishō was one of the performers during the above noted 1867 demonstration. In a later newspaper article he is said to have performed Mai no Te 舞手, literally “Dance of the hand” or “Dance skill” (the ambiguous Japanese language 😉 ). 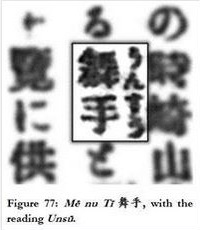 As I have pointed out, I think for the first time, in my A Stroll Along Ryukyu Martial Arts History, to the Kanji “Mai no Te” 舞手 was added the reading of “Unsu” うんすう. It seems that this reading later came to be distorted to Unsu 雲手. Another term that refers to performances of a rather entertaining nature often used today is Bō-odori 棒躍, and there are many others terms used through the ages. Enbu 演武 is just one of those many terms. It became a standard since the early 20th century and is still frequently used today in the official names of martial arts demonstrations in Japan, and Okinawa. Enbu are an important part of contemporary karate and kobudo culture. Enbu 演武 1) To perform martial arts in front of an audience, 2) to train martial arts , 3) military exercises. A group performance is referred to as dantai enbu 団体演武. A larger public demonstration is referred to as enbukai 演武会. A good example for such an enbukai is the martial arts festival held in Paris Bercy. The inherent meaning of enbu today is a martial demonstration in a non-competitive nature, as opposed to shiai 試合 (match), in which the object is not the demonstration itself, but the competition. Enbu may take place solely as a martial arts demonstration, but also often as part of any sort of festival or social gathering. In addition, larger competition-style taikai 大会 (tournaments) today also often include enbu by masters. Well, there is the homonymous term enbu 演舞, however, this refers to 1) to perform dances in front of an audience, 2) to train dancing. An enbujō 演舞場 is a theater, a playhouse. Buyō 舞踊 in turn solely refers to dance. For example Ryūkyū Buyō refers to dances of Ryūkyū. The first character bu 舞 is alternatively read as mai, like in Bu no Mai 武舞 as described earlier. It is also used by the Motobu Udundī school. Furthermore, since around the 1970s the same term Bu no Mai is also frequently adopted by professional Ryūkyūan dance teachers who began to integrate techniques or complete kata from karate and kobudō into dances. These are modern creations which follow the fashion of the time. It can be seen a lot today. Kobudō proponents usually insist that theirs is a martial art and not an entertaining art, yet historically it is completely unclear how much of modern karate and kobudō actually came from stage entertainment arts. Some of the martial arts traditions of today disapprove such a connection, while others maintain it. Asking ten masters, you will get ten different answers. This brings us to another term, namely geinō 芸能, or “public entertainment”. In fact, many Bō-odori (bō dances) or Mura-bō (village bōjutsu) of Okinawa are designated “important cultural assets”. They are classified as Dentō Geinō 伝統芸能, i.e. “traditional public entertainment arts”. Most of them were designated as such around the early 1980s. The above noted Ryūkyū Buyō (Ryūkyū dances) is a subcategory of these “traditional public entertainment arts”. Karate and kobudō, on the other hand, were made an “important cultural asset” in the 1990s, and classified as a “martial arts”. This reflects the self-definition of the masters and followers of karate and kobudō. It seems that Ryūkyū martial arts have many homes. This includes, to name the most important ones, the world of education, police training, public entertainment, disport, culture, theater, tradition, sport, physical education, folk art, military, religious and harvest festivals. Therefore, when talking about Ryūkyū martial arts it always needs to be put into perspective, with era and meaning explicitly defined. Using general statements only contributes to confusion. It is annoying that some people seem to play with this fact. The boundaries between the various fields of influence and origin are pretty much blurred. I feel that kata equally constitute a performing art as well as a martial art. The emphasis some teachers place on the combative component are compensated by the ethical or artistic emphasis of other teachers. Consequently, a universal generalization valid for all schools can hardly be established. This is especially true as every new generation might simply shift or add emphasis according to their own perspectives, or to the demand of the interested parties. Plus, a large number of hardly defined terms are used by people with very different backgrounds. One might say “karate“ while referring to kumite training only. Another one might mix all sorts of traditions, ideas, modern MMA etc. for another random recipe. Many of the application specialists have completely lost connection to the various styles in sense of a performing art and pursue mechanical research of all sorts of kata moves, without in form even remotely resembling anything that would constitute a ryū. This is also the reason why inferences from today’s visage of Ryūkyū martial arts to its precursors or even to possible koryū influences are only valid within a very limited scope. Each generation can only refer to its own teachers and his or her own ideas, and even this might be very subjective views. The most important thing, however, is that no matter what perspective one follows, train well, so that you’re enbu will be well received. © 2015 – 2016, Andreas Quast. All rights reserved. This entry was posted in Unknown Ryukyu and tagged bo-odori, Bojutsu, enbu, Karate, Kobudo, koryu, Wang Ji. Bookmark the permalink.